Have a question you want answered? Email it to us at [email protected]. Question: What are your favorite searching patterns, the flies you tie on when you have no idea or evidence of what the fish are eating? I’m looking for streamers, nymphs, and dry flies. 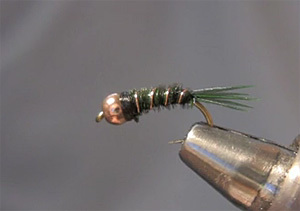 Green Beadhead Pheasant Tail nymph, tied by guide Michael Yelton. Answer: Last week, we took on the streamer portion of this question, so now it’s time to turn to nymphs. You’ll find that the answers vary a lot more than they did in last week’s “Bugger Fest.” The one subsurface fly that gives me the most confidence is the Beadhead Pheasant Tail, in sizes 12 through 16. It looks like many different nymphs and has just the right amount of flash to work as an attractor, as well. Beadhead Hare’s Ear, size 14. A great all-around nymph that has proven itself more than enough to earn its reputation as one of the all-time top patterns. I like to tie mine with a lot of stiff guard hairs in the mix, so it looks really raggedy and traps a lot of air between the hairs. Beadhead Hungarian Caddis Pupa. This sparse caddisfly pupa seems to work everywhere. I have fished it on a dead drift in pocket water on the Deschutes, swung it on a soft line in the Madison, and fished it hopper-dropper on the Bighole, all with good results. Beadhead Prince Nymph. Let’s face: it peacock herl catches fish! All I know is that I have caught fish on this fly from East to West, and I don’t claim to know why it works…it just does! Copper Beadhead Prince with soft hackle, sizes 10 through 18. This fly is a killer. It could be a stone, it could be a mayfly, it could be a caddisfly, and when it swings it could be a minnow. Fish love the bloody thing. Beadhead Prince Nymph. Again, I’d fish this in different sizes, but the Prince is a great fly. Represents everything and nothing, but it is one of those flies that just works. Tungsten Beadhead Peasant Tail. This is very similar to the famous “Frenchie” that the French fisherman use to clean up in international competitions. It looks like a mayfly nymph, a caddisfly, or a worm. I tie it on a curved scud hook. If my life depended on catching a trout anywhere in the world, this is the fly I’d depend on. Fished under a small indicator, it just produces everywhere. Alternates: Fluorescent Pink or Red San Juan Worm. For years, I was too proud to fish this fly. One day on the San Juan, the guide, who was annoyed at my refusal to try one, pumped the stomach of a fish I’d just caught on a midge. It had 12 worms in it, 1 scud and 2 midges. He’s like, “Feed ’em what they’re eating.” I still feel guilty using SJWs, but a size 12 is hard to beat. Red or Copper Copper John, size 16. This fly should be illegal. Fish just love shiny flies. Some days on some waters, they seem to have a color preference but it’s no surprise to me that this is the #1 selling fly in the world. There can be only one, and that is the Prince Nymph. There are so many other great nymphs out there, but the Prince in all of its iterations has no peer in not only my area, but also everywhere else that I have fished it as a searching pattern. The Prince is my barometer and my baseline for whether or what the fish will eat. The only fly that rivals this would be the Pat’s Rubberlegs, but those really tend to slow down on tailwaters, whereas a smallish Prince will just keep right on crushing. Copper Ribbed Hare’s Ear, sizes 12 and 14. A rather pedestrian choice, but it works for me wherever I fish. Alternates: Flashback PMD Nymph, sizes 14 and 16. Olive or Brown Caddis Pupa, sizes 12 through 16. My concept of a searching pattern is that it should resemble as many common food forms as possible—not an exact imitation of anything, but a pattern that suggests a wide range of natural foods. This is what makes it work in all seasons and at various times of day and in a variety of different waters. Still, picking a single favorite dry fly and nymph is difficult, as I spend a lot of time fishing spring creeks and tailwaters, and they demand a different searching pattern than a freestone stream. On a spring creek or tailwater, a well-tied Pheasant Tail is my workhorse pattern. On freestone streams, I use a smallish Rubber Leg Hare’s Ear, which imitates small (and immature) stonefly nymphs, as well as a range of mayfly nymphs. Hare’s Ear Nymph, lightly weighted, no gold rib. OK, not particularly exciting, but this fly looks like every nymph everywhere, it is very quick and simple to tie, and is as buggy looking as they come. It really is the ubiquitous nymph. Pheasant Tail in various sizes. It’s my go-to fly for all of the Baetis hatches when the trout are generally feeding on the nymphs just below the surface. Hare’s Ear Nymph, sizes 10 through 22. Effective anywhere in the world.